My Strat build is complete!!! Discussion in 'Guitars in General' started by SFW, Jan 30, 2012. So a few months ago, I decided that I needed a Strat again. I haven't owned one in a while, and it's been almost 15 years since I owned a true three single-coil Strat. So I decided it was time. The last three single Strat that I owned was in the mid 90s, and it was my main guitar for years, before I went into Les Paul land. I have set this one up to be as close as possible to that one from yester-year. Specs are: 1995 Fender alder body with vintage six screw bridge. Fender maple neck and three Fender-Lace Sensors. 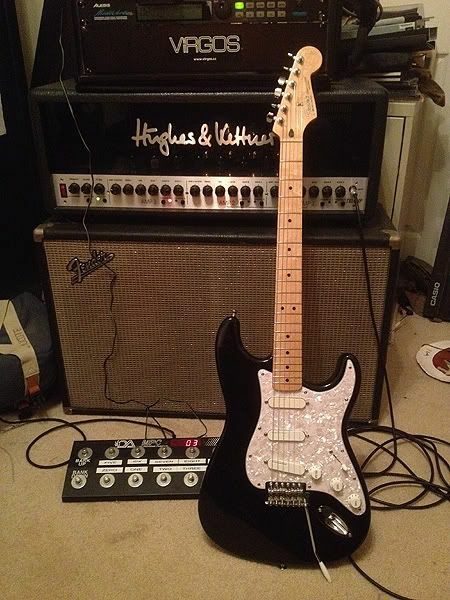 (I guess you could call it my Strat Plus/ Clapton wannabe.) Finally got it strung up and setup this evening. Plays like butter, and sounds as amazing as I remember my old one did. I'm a very happy camper right now! Nice Strat build. Love that maple neck.